It's Katie bringing you another week of tips, hints, styles, and trends to help you look and feel your best! You may have heard of one of the latest health trends: diffusing essential oils. Diffusion refers to any method or device that disperses aromatic scents into the air. It's a simple way to add a subtle yet noticeable aroma to any space. It even allows you to get creative and customize your own blends. Plus, science says that diffusing certain blends can help battle unwanted germs, alleviate insomnia, and even boost concentration. 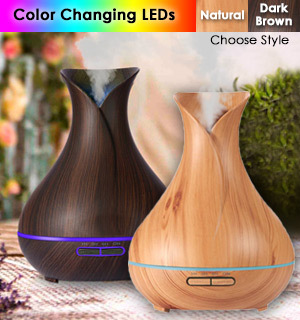 Essential oil diffusers are excellent tools to get beneficial essential oils into the air, where their effects can be felt. They have long been used in aromatherapy treatments as they help to cleanse the air and promote soothing feelings in the environment. Although they are usually used for either aesthetic or therapeutic purpose, they also boast some amazing health benefits! Diffusers offer an incredible amount of benefits to everyone. Mixing your aromatherapy oils can leave you feeling relaxed, uplifted, confident, energized, creative, and motivated, among others, depending on the type of oil you choose! If you are in the market for a diffuser, this Deluxe Humidifier and Aroma Diffuser will not only add a touch of class to any room, you'll also get all the benefits of aromatherapy when you add your own essential oils! The large 400mL capacity means you can go 6-12 hours without needing a refill using the weak or strong mist settings. Adding a just drop or two of essential oils will diffuse scents for a natural air freshener. Whether you want to energize in the morning with some lemongrass oils, or unwind with soothing lavender, you can even make up your own blends!